The video above is the latest collaborative effort to bring FIN’s message about the need for improved fish passage and upgraded stream crossings to a wider audience. FIN or the Fisheries Improvement Network is a forum where forest landowners and managers can interact with agency fishery managers and organizations interested in improving Maine’s fisheries resources. The idea for FIN came from the Maine’s Sustainable Forestry Initiative (SFI) Implementation Committee. 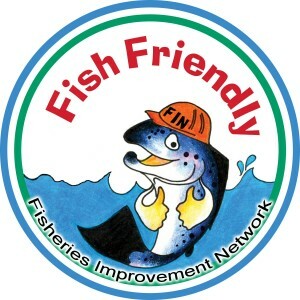 The SFI Committee saw a need for landowners to be informed in an organized way about the many initiatives related to fisheries habitat improvement that are underway in Maine, particularly around the issue of stream crossings and connectivity. This topic is very relevant to landowners since most of the best inland fisheries habitat in the state intersects with Maine’s working forest. At the first FIN meeting landowners presented a framework detailing how the landowners would like to work to improve fish passage and stream connectivity at stream crossings. Key to this framework was the desire to keep the process voluntary, allow landowners to proceed at their own pace and to provide landowners with information from the agencies to help allocate resources to where they would have the greatest habitat value. At its core FIN is about information sharing part of the framework. Currently full FIN meetings are held on an annual basis. The meetings are an opportunity for landowners and managers to be brought up to date on what is happening in the fisheries habitat arena, and to share their own innovations and activities related to habitat improvement. Topics discussed at previous meetings have included, how landowners can access habitat data for making better decisions about crossing upgrades, stream barrier inventories, innovations in stream crossing design, the Atlantic salmon recovery plan and funding, technical assistance and training opportunities open to landowners to name a few. Between the FIN meetings, the FIN steering committee members thought it was important to provide new information to the FIN members as it became available. The “FIN Facts” information sheets are meant to be a means of quickly sharing information on fisheries improvement topics. Topics can come from anyone involved with FIN and include anything relevant to forest landowners and managers relating to the topic of fisheries improvement, such as new crossing design innovations, tools available to landowners to help prioritize crossings for replacement, new training opportunities etc.